Consent forms for the 1st year visit to New Lanark have been distributed. If any pupil didn’t receive their form, please see Miss Walmsley as soon as possible. Completed consent forms and money should be handed into your science teacher during normal lesson time. On Wednesday 23rd November, the Marines delivered two sessions with the senior pupils in the Higher Physics and National 5 Sport and Recreation classes. 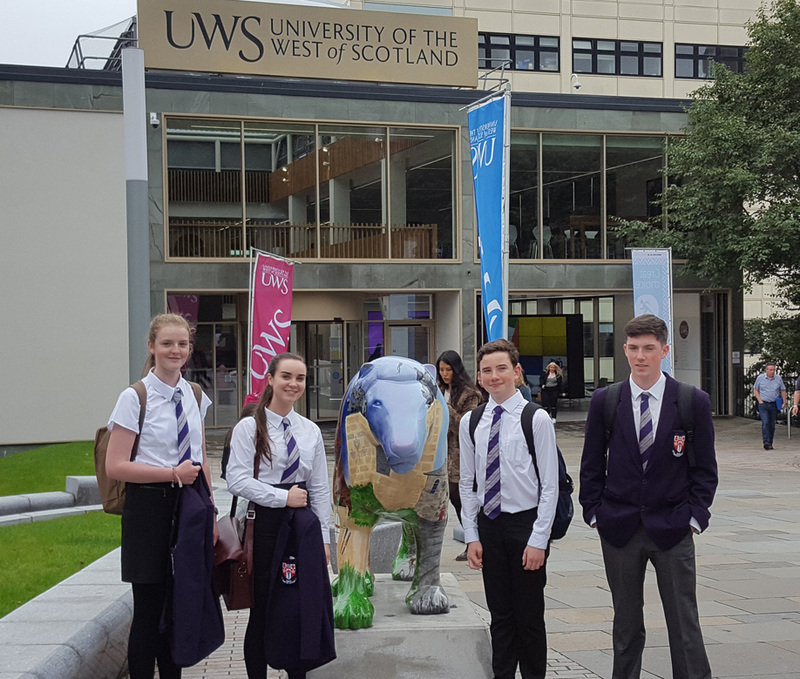 On Tuesday the 25th of October, pupils from local secondary schools in North Lanarkshire, studying Physics at Higher level, attended a lecture at Our Lady’s High School from Martin Hendry, Professor of Gravitational Astrophysics and Cosmology in the School of Physics and Astronomy at the University of Glasgow. Professor Hendry’s lecture consisted of information regarding Gravitational Waves, Dark Energy and The fundamentals of Albert Einstein’s Theory of Relativity. Hendry’s efforts in Astrophysics and Cosmology have allowed him ,and the team at The Laser Interferometer Gravitational-Wave Observatory (LIGO), to accomplished the great feat of helping confirm Einstein’s theory of Gravitation. In detecting evidence that Einstein’s theory is correct, they have further increased our understanding of the universe and the ways in which time, matter and space ,as we perceive them, operate. Professor Hendry’s efforts and enthusiasm in physics are sure to inspire a new generation of physicists who will eagerly further our knowledge of the universe. Gravitational waves are distortions in the fabric of space and time given out during high energy events in our universe. During these high energy events, ‘ripples’ of gravitational waves are emitted and travel at the speed of light a little bit like dropping a pebble into a pond. Professor Hendry and the team at LIGO developed and improved the technology used to detect these miniscule distortions in space-time. By reducing uncertainty in the collected data and improving the sensitivity of the equipment used it led to the discovery of gravitational waves early this year. The discovery of these waves is characterised by a chirping sound which Professor Hendry so eloquently recreated. Hendry and the team at LIGO did what many Physicists thought was impossible, to prove Einstein’s theory. There are increasing detections of gravitational waves with more being discovered each year. Furthermore, Hendry discussed the further implications of Gravitational waves and the extent of how ground-breaking this discovery of gravitational waves are in the world of physics. It is possible that the team at LIGO may be in the running for the Nobel Prize in Physics. On behalf of all the pupils who attended Professor Hendry’s lecture, we would like to thank him for his time and entertaining talk and to wish him and the Team at LIGO every success. Without a doubt, the highest standard first round of the competition I’ve witnessed over the last ten years. Teams of three students, each answering three questions, no confering, for a total of 6 marks apiece over three rounds. With another 6 marks possible for the written answer team round, that brings the total available for National 5 Physics related questions to 24. We lost a mark for forgetting to include the unit in the team round. Hopefully a lesson learned for their SQA exams. Notre Dame performed flawlessly on these directed questions. Bearsden and Dunblane only lost 2 marks apiece. In total therefore, the 4 teams scored 95%, an impressive knowledge of their work up to now. With a four mark anagram round and the competition opening and ending with a buzzer round worth 20 marks, the outcome was determined by reflex as well as general knowledge and familiarity with current news items. As far as memory serves I can recall only 3 questions in these rounds that the teams couldn’t answer correctly. After the 1st round Bearsden and Dunblane were ahead by 5 marks. By the last round Bearsden had a slightly reduced lead with Dunblane a couple of points adrift. A good last round from Our Lady’s High and they were level with Dunblane with only one more question to answer. As the words of the immortal Scottish Bard wrang out, I was screaming for our team to just buzz in … screaming inside my head that is … and I watched as one of them pressed their buzzer. Their buzzer light did not stay on and I waited to hear which school had buzzed first. It was Dunblane. Sure enough they had the correct answer and along with Bearsden, the clear winners, two very worthy teams progress to the semi-finals. With Notre Dame only a couple of points behind us the heat was not only of a very high standard but also very evenly balanced. Well done to WoSPEG for delivering such a vibrant celebration of Physics. Our team of Patrick Quinn, Emma Dolan and Heather Nugent were an absolute credit to our school. They couldn’t have performed better other than perhaps having cybernetic implants to improve their speed of reflex. Along with the excellent cheerleading reserve Ryan Kane they seemed to thouroughly enjoy the competition, the experiments laid on prior to the quiz (mainly involving liquid Nitrogen) and the complimentary drinks, chocolate and WoSPEG mugs for participants. There’s always next year. 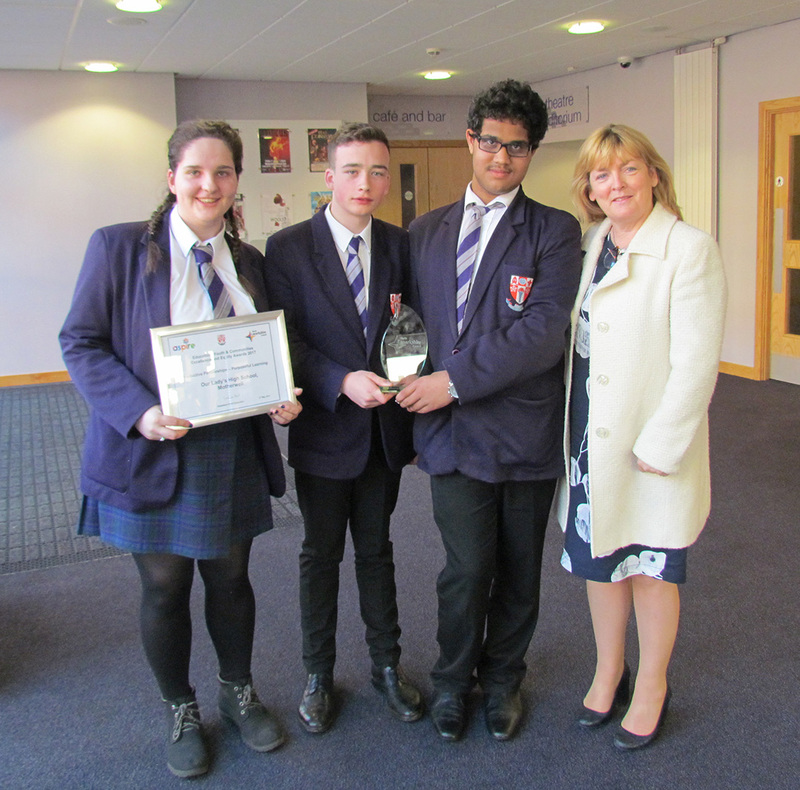 Pupils in S1, S2 and S3 have been planting seeds from space. Packets of rocket seeds were sent to the International Space Station under the care of astronaut Tim Peake. Those seeds were then sent back to Earth and delivered to schools with another packet of rocket seeds from the Royal Horticultural Society. Schools only know that there is a blue packet and a red packet; we don’t know which seeds have been in space. Pupils and staff will now measure the blue and red trays of seeds and identify any differences between them. Pupils suggested that the lack of gravity in space may have impacted on the growth of the seeds. Rocket Science report from the BBC. After ten weeks of effort, the Our Lady’s High School S2 Go4SET team presented their findings to a panel of judges at the Banqueting Hall, Almada Street in Hamilton. Researching, report writing and model building completed, the 5 members of the team displayed and explained their findings in an enthusiastic and professional manner. Thanks to John McIntyre of the competition organisers (EDT) we were able to have a “Launch Day” at the school. He presented them with a choice of options. They decided to progress an investigation into an environmentally friendly railway station. Roles assigned, they each took on responsibility to enable a full report to be completed, detailing any visits and research conducted in order to arrive at recommendations. A trip to Glasgow Central Station proved extremely difficult to organise. Although staff appeared enthusiastic, no arrangements could be provided to enable information or a tour and in the end we decided to visit on our own. One afternoon the students collected footfall data in order to determine potential energy gains from power mats at entrances, exits and escalators/stairs. A visit to the New Lanark World Heritage site was arranged by our industrial sponsor, Mr. Stephen McCann of Morrison Construction. This proved to be an excellent introduction to the generation of electricity via water power. His advice also proved very beneficial with regard to life skills such as meeting deadlines, organisation and delegation of tasks. These students gave up a great deal of their own time in order to fully engage in the tasks. Breaktimes and after school, especially with the final deadline looming, resulted in a very rewarding mix of effort, enthusiasm and co-operation in order to complete the challenge. They finished 4th out of 11 teams, losing by only 3 points. Well done to all the students participating, including the 3 members of the team that couldn’t make the finals day. Thanks go to Morrison Construction and the competition organisers, EDT (Engineering Development Trust) for their much appreciated contributions. From Miss McGinty’s S2 Science class. I’ll go see them one day! Woohoo!! OLHS have secured a place at @Salters_Inst Festival of Chem for 4 lucky S1 pupils.Let your Science teacher know if you want to go! !